It is a university church affiliated with Nicolaus Copernicus University, the oldest and biggest university in the north of Poland, founded in 1945. 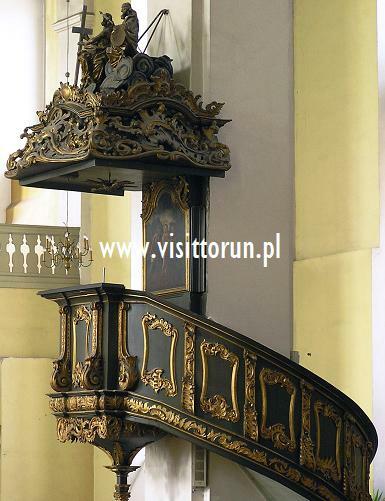 The church was built in late Baroque style in the mid-eighteenth century by the Protestants, who were dispossessed of St. Mary’s Church as a result of the Tumult of Toruń in 1724. The slender church tower was added later, i.e. at the end of the nineteenth century. The interior of the church underwent changes in 1945 (some elements were removed), when it was taken over by the Jesuits. In 1989, the valuable organ was burnt (in 2005-6 the organ under reconstruction). Today, we can admire, for example, the mid-eighteenth century Rococo high altar and the beautiful door with intarsia on the axes of the aisles near the presbytery, depicting Christ’s death and resurrection. 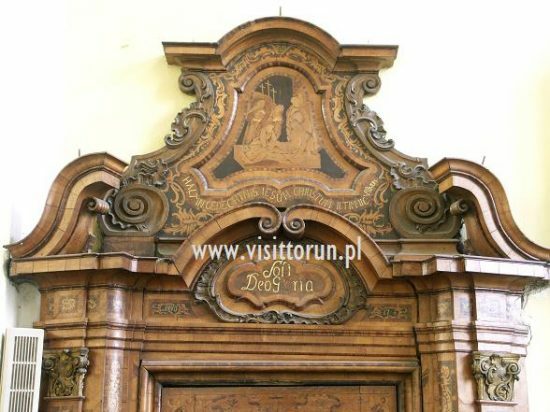 The door is an example of Toruń’s high standard artistic woodwork. Interiors sightseeing: the church is in religious use thus the visit is possible outside the mass hours only. The church is open for visitors all year round, all day long. Fragment of a portal with intarsia inside the church, which is an example of Toruń's high standard artistic woodwork, mid. 18th century. 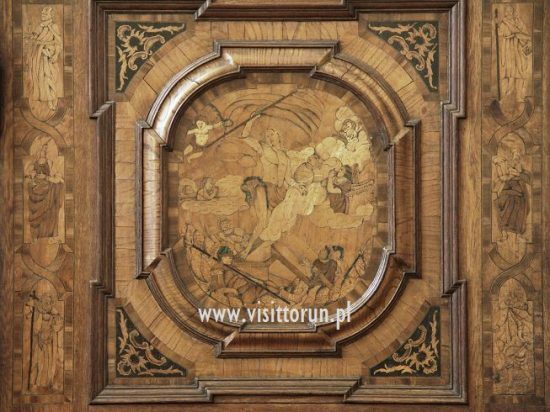 Fragment of a door with intarsia inside the church, which is an example of Toruń's high standard artistic woodwork, mid. 18th century.